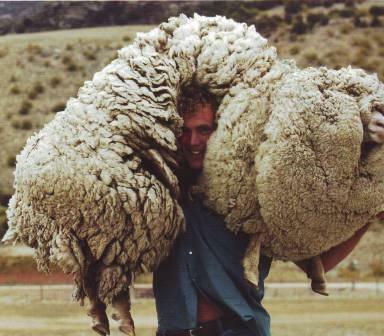 Merino Inc is seeking photos which depict the day in the life of a merino sheep to showcase the industry. 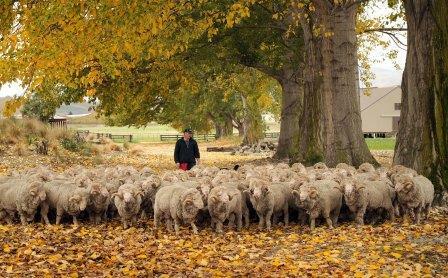 It’s offering cash prizes for the three best photos taken by merino farmers, their families or people who work in the merino industry. Merinos are prized for their fine wool which in recent years has bucked the trend of decling prices suffered by crossbred wool. It’sbecome well known through brands like Icebreaker, popular for its lightness, warmth – even when wet, breathability and machine washability. Trampers, musterers and others who can’t have a daily shower also value it because it doesn’t get smelly. The most famous merino is probably Shrek, a whether, which evaded musterers on Bendigo Station for six years. When he was finally captured his 27 kilo fleece was shorn and aucitoned for charity and Shrek became an ambassador for Cure Kids. One of the reasons for Shrek’s fame was this photo of him being carried by musterer Daniel Devine on the day he was found. Shrek retired last year after earning about $100 million for charity. Dean . . . said the Government realised high country lessees were among those farming sustainably.
. . . We don’t have an agenda to drive Merino off the high country and we don’t have an agenda to froce access on the land whether it is land under tenure review or freehold. She said the Government also opposed striking rents based on amenity values and instead believed they should be linked to the property’s productivity.
. . . Dean said she was particularly interested in seeing grazing licences reintroduced in the high country and it was a view also held by the Government, if it was appropriate and backed by the farming community. High country lessees have been facing uncertainty about their futures and paying rents several times greater than their gross incomes because of the previous government’s policies which sent a very clear message that farmers were neither appreciated nor wanted in the high country. High country farmer John Perriam of Bendigo Station said Dean’s views were “refreshing” for the industry and put confidence back into the high country, which was desperately needed.
. . . He also endorsed the Government’s views on abolishing rents based on amenity values. The beauty of the high country is a product of generations of careful stewardship by farming families but it doesn’t contribute to pastoral farm incomes. It is indeed refreshing to have an MP and a government which appreciates that.